The companies on the list were unchanged from 2016. There were only subtle shifts in the ordering. Shonika Vijay , senior analyst from Strategies Unlimited, said that companies with significant investments in the automotive LED lights business had fared the best with significant growth in that part. Companies focused on general lighting had not fared as well. Cree, for example, moved down a spot based on a general lighting focus, and a product line centered on high-power LED lights. Still, only Nichia is clearly separated from the pack with a 13% slice of the LED market. Lumileds and Osram each have 8% shares and the rest of the list spans the 2-5% range. 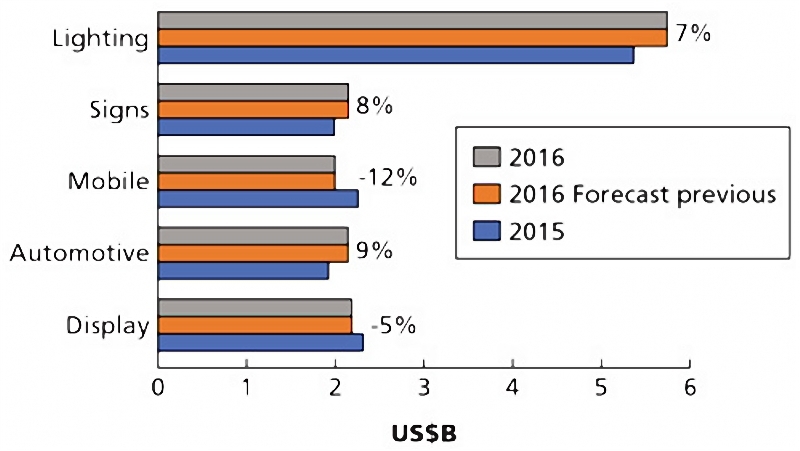 The general trend in the LED light market for 2016 was up, and projections are more optimistic than what the audience heard in 2016. The following diagram depicts the growth in the sector from 2015 to 2016. LED revenue in the general lighting sector was up 7%. Automotive LED light was even higher at 9%. But the mobile and display markets are declining. Automotive LED lamp market has been the top sector for LED revenue growth in the recent past. There are many reasons for the good news. Penetration of LED technology into lighting and automotive is still relatively low, so the sectors see increases in revenue even as component prices fall. And price declines have been less severe in the past year. Vijay said price climb in 2015 had been as high as 40% but was in the 20% range in 2016. Clearly the over-supply situation has eased, and product developers in demanding lighting and automotive LED lights applications are choosing higher-quality components. Looking forward, Vijay projected 5% growth in packaged LED revenue through 2021. The LED lamp market is estimated to grow from 1.7 billion units in 2015 to 4.5 billion units in 2022. But drops in average selling prices (ASPs) will mean that revenues will begin a steady decline around 2019 and of course socket saturation will be a factor as well. The LED light market will grow for a much longer period with ASPs not declining at the rates of the decline in lamps, and with a lower current installed base. For example, LED-based indoor ligthing fixture revenue will go from around $20B (billion) in 2015 to nearly $45B in 2022 (Fig. 4). Smallwood projects that the troffer space will show the greatest growth rate over the period, going from $4.4B to over $10B even as ASPs decline. The news is also good in the outdoor sector, although the magnitude of the numbers is lower because the indoor market is simply a larger one. 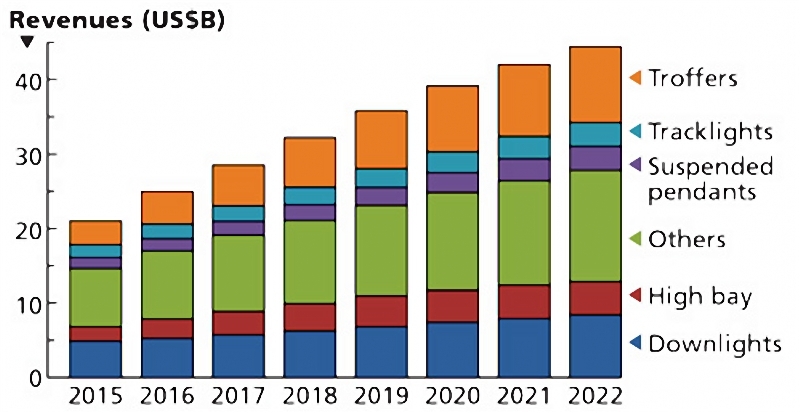 LED light revenue in outdoor will go from around $3B in 2015 up to $6B in 2021. Of course, LED will succeed in many more applications outside of general lighting with some already being penetrated, but with a much larger potential in the future. Consider disinfection in facilities from medical to athletic to daycare. We have written previously about how ultraviolet (UV) energy can sanitize a surface or water immediately. In fact, that concept was presented several years back. But UV light can	be safely used in an open building space where humans are present. There are many great opportunities for LED lights, but many are centered around the IoT and new applications that would be serviced by other industry or technology sectors.